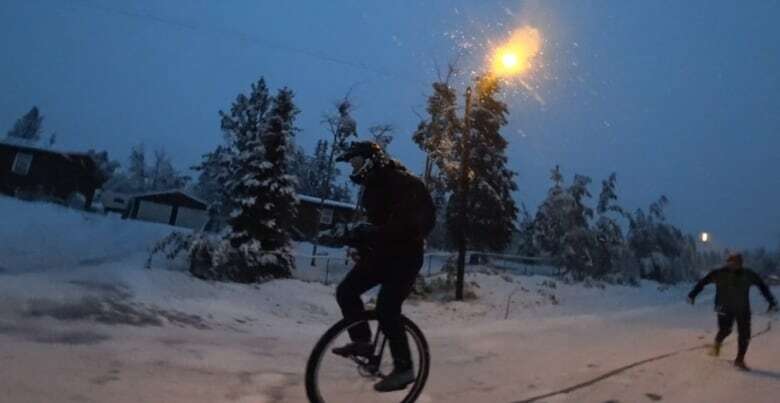 For the 1st time in 25 years, a freak snowstorm cancelled the annual Yukon-Alaska bike relay. Word didn't reach Ned Rozbicki and his unicycle relay team. It was supposed to be the 25th anniversary celebration of a favourite annual bike race. 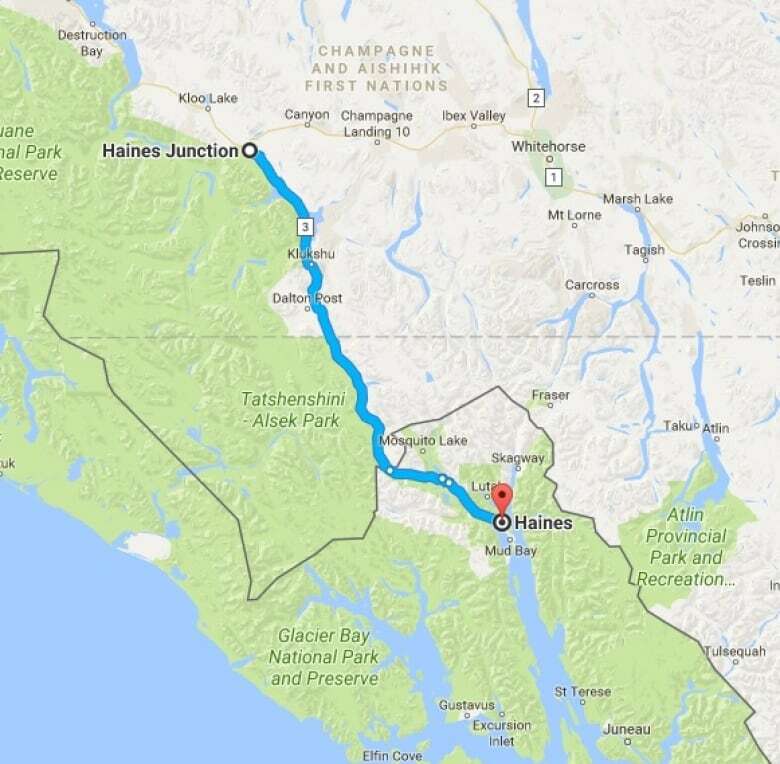 Instead, this year's Kluane Chilkat International Bike Relay — a 240-kilometre race from Haines Junction, Yukon, to Haines, Alaska — was cancelled due to a freak snowstorm. Word didn't reach Ned Rozbicki. He woke up around 3 a.m. for a last minute gear check before he and his three teammates prepared to launch a unique attempt to complete the relay by unicycle. "Feels alright," he told the team, tentatively, after mounting a unicycle on a snowy road. The four went on to be the only team to complete this year's race. "To be fair, we were the only team that started," he told CBC News. The trip was planned as a wedding gift for Rozbicki, who's tying the knot today in Alaska. The team — which included Ben Richardson, Jim Sowers and Nathan Hoover — anticipated a wet, rainy race. They woke up early to get a jump on the day. "We skirted the rules a little because basically the race isn't set up to accommodate unicycles," Rozbicki said, "so we knew we needed to start early if we were gonna make the party at the end." A little snow didn't deter them — though it did give them pause. "I think it's fair to say we all started thinking there's no way we could finish," Rozbicki said. For Rozbicki, unicycling lets you live in the moment. On a bike, the eyes and mind can wander. "On a unicycle, it's a much more immediate experience," he said. "Every second, you're balancing in a way that's more dynamic, so it's just kind of lizard brain, you're going back to the primeval part of your brain where you're just concentrating in the moment." Unicycling has come a long ways in recent years, he said. "It's still a fringe sport, but the unicyclists out there are pretty gung ho." "My main thing is unicycle basketball," said teammate Sowers. Two years ago, he unicycled from Mumbai to Goa in India. He described the race as physically challenging, and made more so by the cold weather, and the rain and snow that had him wringing out his socks between legs. The plan — even after they learned the race had been called off — was to just ride "until we absolutely had to stop." "Slowly the conditions got better instead of worse, thankfully." "It definitely got fun," he said. "It went from, OK, we have a huge challenge in front of us, to we can do this, to we did it." Rozbicki was one of many who've felt the pull of the race that had to be capped at 1,200 riders a few years ago when its fame began to draw more people than organizers felt they could safely handle. "I'd done one leg of it before," Rozbicki said, describing terrain that climbs and drops about 2,400 metres in elevation in all. "It's challenging. Weather is usually a factor but not quite to the degree that it was for us." In Haines, pop. 1,300, they were greeted by a classic king salmon barbecue. "The whole town turned out," Rozbicki said. "It was a great little shindig." The team's reputation preceded them, because people driving back after the race was cancelled had passed them on the road, honking, waving and stopping to say hello, and marvel at their spirit of adventure. "We were small town heroes for a day." And finishing the event, he says, was a great feeling. "It was a great bonding experience for four guys who share the love of kind of a unique sport but a really rich one."